I am going back to my phase of vegan cuisine. Once in a while I just want to eat plants only, it makes me happy. I usually do have an 85% plant based diet, but I want to be 100% plant based for a couple of months. I am leaving fro France next Monday and looking forward to discovering some new products while I am there. 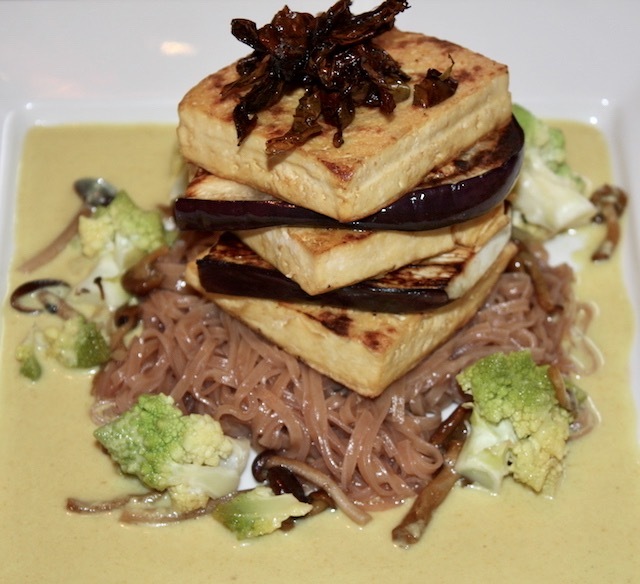 I was browsing through my vegan cookbooks and one of my favorite is called “Great Chefs Cook Vegan” and I found an inspiring recipe from Jason Cunnigham from which I had made quite a bit of changes to the original recipe, but kept the essence of the dish. I found those delicious green tea brown rice noodles that are very easy to prepare, you don’t have to cook them, just soak them in hot water for a bit and the trick is done. You could easily substitute the noodles by brown rice if you prefer, but I love the chewiness of brown rice noodles, so for me no substitution is needed. I discovered this particular red seaweed called dulse (or sea lettuce). It is very nutritious, has high protein content and contains lots of fibers and mineral (like most seaweeds). When saute in a pan, it gets crunchy and tends to develop a bacon-like flavor and quite tasty. I like to use it as a topping on tofu or salads or vegetables. Drain tofu and pat dry with a paper towel to remove excess water. Sprinkle salt on eggplant slices and let sit for one hour until it releases water. Rinse and pat dry. In a mixing bowl combine say sauce, sesame oil, vinegar and ginger and mix well. In a deep tray, place tofu and eggplant. 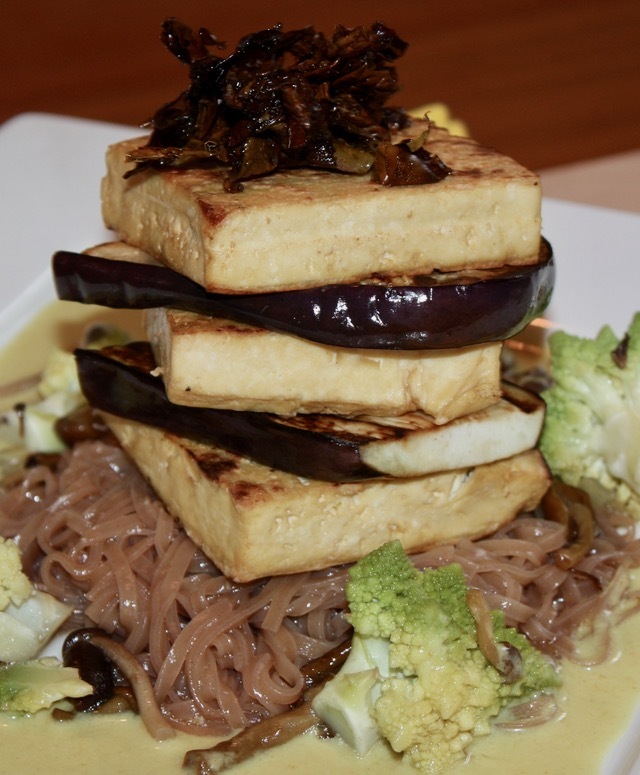 Take 3/4 of the above marinade and pour over tofu and eggplant. Coat well and marinate for about one hour. Heat oil in a small pot and saute onions. Add garlic, ginger and lemongrass and cook 3 minutes at medium heat. Add curry powder and stir for about 3 more minutes. make sure not to burn the curry. Add broth and cook until the mixture has reduced. Add coconut milk, simmer for about 5 min, then remove from heat. Blend mixture in a blender until smooth texture. Strain the sauce and return to stove with low heat. Add salt and keep warm. To make the crispy dulse, saute in a pan with olive oil until crunchy. Make sure not to burn it or it will get bitter. Soak noodles in hot water for 10 minutes. Drain and rinse with cold water. Toss with left marinade from tofu. In a pan saute shallot in vegetable oil, add mushrooms and romanesco. Add 2 tbs mirin and simmer with lid until the water evaporates and romanesco cooked all the way through but still firm. This entry was posted by silvia on March 1, 2017 at 4:37 am, and is filed under Vegan. Follow any responses to this post through RSS 2.0.You can leave a response or trackback from your own site.